Farm to Brewery: Budweiser Keeps It Local with Taste of St. Louis | Eat It, St. Louis! Recently, I received an intriguing invitation to have dinner on the Eighth Floor of the Anheuser-Busch brewery. Four past winners of Budweiser Taste of St. Louis Chef Battle Royal would be making dinner for me. A brewmaster would be pairing my courses with interesting beer. Really? Moi? 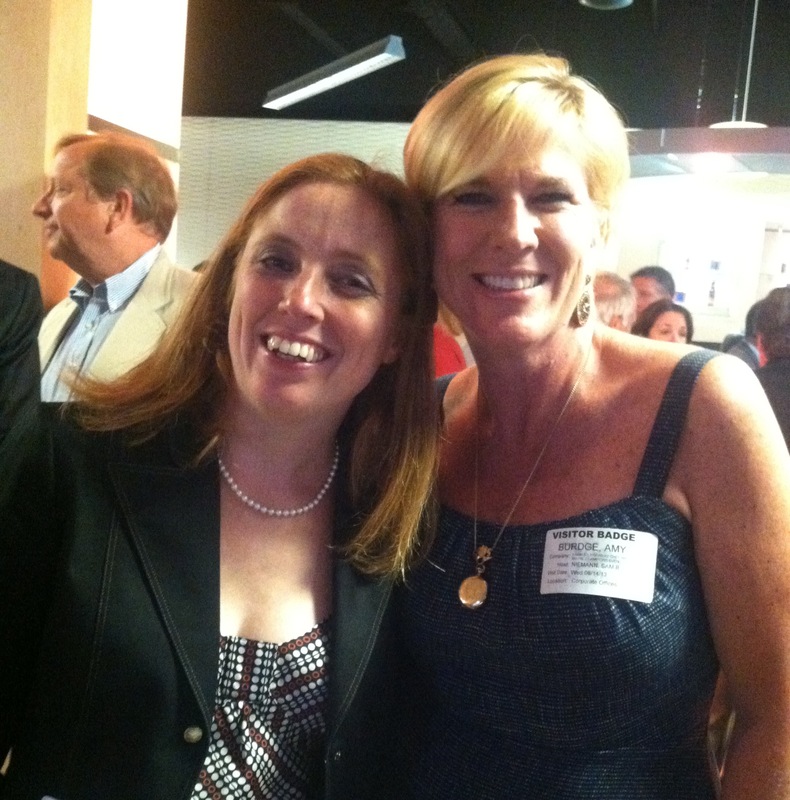 Hanging out with the “fooderati”* and beer barons of St. Louis? But of course! I was tickled pink and happily accepted. The Farm-to-Brewery Chef Battle Royale Champions’ Event was a wonderful way for Budweiser to celebrate its commitment to Taste of St. Louis** as the event’s lead sponsor; to bring together past Chef Battle Royale winners; and to illuminate what’s great about our region’s culinary scene. Our hosts for the evening were Anheuser-Busch Executive Chef Sam Niemann and Brewmaster George Reisch. Together they created four beautiful courses paired with four styles of beer. What’s more, each of the courses featured deluxe ingredients from some of our region’s genius craft producers. 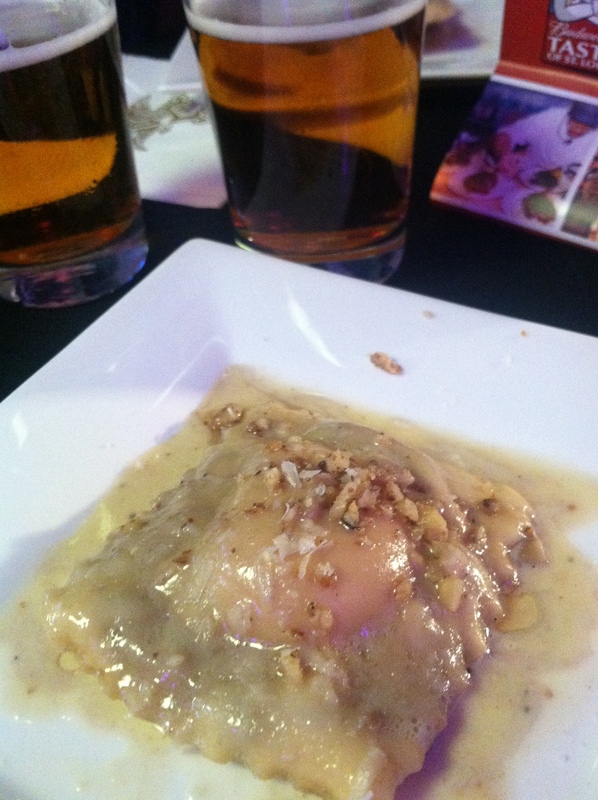 Vito Racanelli, chef-owner of Mad Tomato and executive chef of the Budweiser Taste of St. Louis for the past five years, and Chef Neimann conceived and presented the evening’s first course: Ravioli tossed with shiitake mushrooms and walnuts. The shiitakes were sourced from Ozark Forest Mushrooms, where Nicola MacPherson lovingly grows her meaty, heirloom mushrooms on white oak logs***. This lovely little pillow of pure love featured a delicate egg yolk (from Shiloh Hill Hens) nestled inside, and the cream sauce was blended with brown butter and Budweiser Black Crown. Brewmaster Reisch – who suggested small sips before and after every bite to allow the flavors to burst with the beer’s carbonation – paired the ravioli with Black Crown. A new entry to the Budweiser portfolio of beers, it is brewed with toasted caramel malt and various American hops and then finished over beechwood to produce a nuanced golden amber lager. The course was terrific, and everyone at my table was primed for what came next! The second pairing featured balls, fabulous balls, made of locally sourced pork. Chef Wes Johnson of Metropolitan Farmer in Springfield, Missouri, created pork and fennel meatballs. The juicy, flavorful meat came directly from Circle B Ranch. Marina and John Backes, proprietors of Circle B Ranch, like to say, “A happy hog is a tasty hog.” Take note: Their hogs must be simply giddy, because those pork meatballs were delicious! UUUMMMM, pooorrrrk! 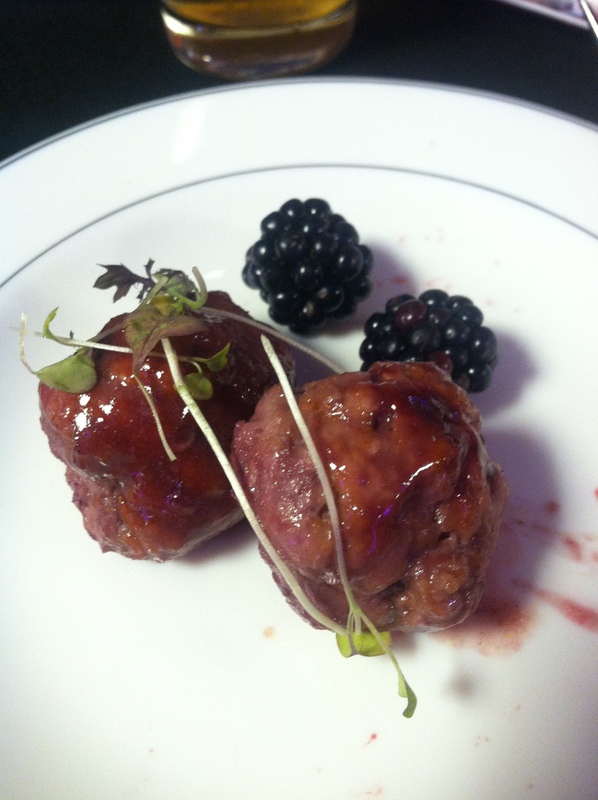 Chef Johnson dressed the porky good meatballs with blackberry sofie jam, for which Goose Island Sofie provided the base. Really, who doesn’t love a beer-y jam? Course three, how I loved thee. Let’s just start by saying Chef Jack W. MacMurray III of Jack Mac’s Distinctive Taste served up lamb; beautiful, tender, juicy lamb from Jones Heritage Farms. I’m still crushing on this lamb chop, which was served on a sweet potato, vegetable, and gruyere hash and included a dash of Beck’s Sapphire for depth. Good God, I’m still giggling like a love-sick school girl when I think about it. How did chef know to include all of my favorite flavors on one plate? However he did it, thank you! The dish’s Beck’s Sapphire beer pairing really stood up to the lamb. As Brewmaster Reisch explained, the beer is brewed with German Sephir hops and includes just four ingredients. This is a beer-lover’s beer with its edge of bitter and really smooth finish. Sip-taste-sip … it was magic. Then there was dessert. It featured Stella Artois Cidre ice cream – yeah, that’s a real thing – atop an apple and cornmeal cake with a divine dollop of apple butter on the side. Chef Christopher Lee from the River City Event Center brought this perfectly sweet (which for me means it wasn’t cloying) finish to the party. He tapped Justin Leszcz from Yellow Tree Farm for the apples. Bite after bite was fresh and sparkling and satisfying. Clearly, to complement the dish, Brewmaster Reisch introduced a tasting of the Stella Artois Cidre, which my cider-loving husband has been dying to try. It truly delivered a crispness that reminded me of crunching into apple. It was tart and fizzy and a wonderful way to close out a wonderful experience. It was a terrific night full of friends, food, and beer. I had a great night out with my sweet hubs, Mark; we mingled with St. Louis’ super-successful blogger, Stefani Pollack (check out The Cupcake Project); we laughed with George Mahe, Dining Editor for St. Louis Magazine and his effervescent wife, Suzi; and rubbed shoulders with Sauce Magazine publisher, Allyson Mace (not pictured, because I’m lame). And the chefs seemed to have as much fun as the guests! Chefs wrapping up the evening. Sorry, Chef Rancanelli, for cutting you out. We St. Louisans take our food and drink seriously. When a powerhouse like Anheuser-Busch brings the local chefs together, who in turn bring the local producers together, it’s quite the collaboration. I was honored to be invited to share the evening; rest assured, it was my pleasure to Eat It, St. Louis! * Fooderati: My own made-up word. We eat better than the glitterati and look just as good! ** Budweiser Taste of St.Louis, Sept 27 – 29, Soldiers Memorial. Be there. *** Fun Fact: Commercially grown shiitake mushrooms are grown in sawdust. **** That and $2.40 will buy you a venti coffee — nothin’ fancy, mind you — at Starbucks. It was a really fun night, Mom! Sometimes I can’t believe how lucky I am to have these kinds of opportunities. First off, LOVE the word “fooderati” and second, Goose Island Sofie is amazing! Congrats on getting to be at such a wonderful event! Hi, Michelle! Thanks so much for reading. Few things make me happier than writing a piece that people enjoy. 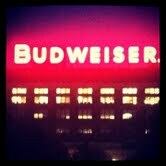 The food was really great, the chefs were engaging, and the good people at Budweiser were fabulous hosts! I was excited (and honored) to be invited. Sounds like a fun time! I really like Mad Tomato, so I know the first course must have been awesome. Love your new word, Fooderati! That’s a really good one. Good to see you post again! Hi, John: You keep me inspired to keep writing. I hope to be back at it on a regular basis. And thank you! I, too, love Mad Tomato. The homemade toasted ravs that change daily are to die for. Cheers, friend! Way to go. Sounds like it was an yummy evening. Thank you, Ra, for reading! It was quite delicious and — just an importantly — a really fun celebration of St. Louis Chefs, growers, and BEER! Cheers!